This is what Sunday morning looked like at our house. I was inspired by some beautiful strawberries I bought at the store yesterday, so I wanted to make a special breakfast. 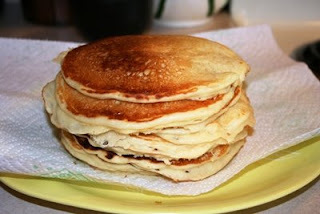 What says "I Love You" more than a stack of hot, homemade buttermilk pancakes??? Well, I'll tell you what. 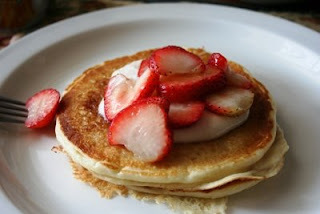 A stack of hot, homemade buttermilk Strawberries Romanoff Pancakes with Brown Sugar-Sour Cream Sauce. That's what. A very good friend of mine from back home in Savannah, Jared, sent me for an engagement gift a year subscription to "Southern Living" magazine. He explained that he didn't want me to "forget how to be Southern." Although it is doubtful that I will EVER not be Southern, it was a very sweet gift. And I must admit I was so excited the day it landed in our mailbox that I had to fight every instinct in my Southern body not to plop on the couch right then and there and read it cover to cover and commit it to memory. In the April 2009 issue of "Southern Living" magazine there were tons of scrumptious recipes. And one section on strawberries caught my attention. The pancakes we had this morning were based on one of these recipes. First thing I did was wash and slice about 6 strawberries. Then I sprinkled them with 2 tablespoons of sugar and about 2 tablespoons of Apple Jack Brandy. The recipe called for orange liquor, but I didn't have any. Believe me, I didn't miss it. I covered those and let them sit and macerate for about 30 minutes, while I made the sauce and the pancakes. For the sauce I mixed about 1/2 a cup of sour cream with 2 tablespoons of brown sugar. I covered that and put it in the ice box to wait for breakfast. Then, I made the pancakes. In case I haven't posted them before, it's an egg, 2 cups of buttermilk, a tablespoon of sugar, a teaspoon of salt, 3/4 teaspoon of baking soda and enough flour to form a thick pancake batter. And I do mean thick. If you don't add enough flour, they will stick like crazy to your griddle. 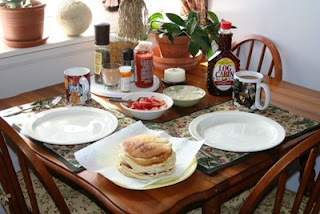 To serve I just stacked up 2 pancakes, topped it with some sour cream sauce, then put some of the berries on top of that. This was so good!!!! I will do this again and again. And I will also use the Apple Jack/sugar maceration technique with other fresh fruit. What a great way to start my day of cooking exploration! Now I was on to my carrot cake...but that's another post.